Hours of Operation: Tues. – Thurs. 11:30 a.m. – 1 a.m.
Fri. – Sat. 12:30 p.m. – 2 a.m.
Sun. 5 p.m. – 12 a.m.
Best time to visit: Any time. There are bars that draw a crowd with ambience, and then there are those that flog you over the head with it. But who’s to say that’s a bad thing? Piratz Tavern fulfills Silver Spring’s need for a dive-y bar/restaurant, but takes it a giant step further. It takes its Pirate theme seriously – from the décor to the servers’ attire to the menu. The drinks also adhere to the theme, which is good news for the rum-fan, bad news for the beer-drinker. While the Grog is a devastating but delicious ginger-laced concoction, the beer selection is primarily from the bottle. The options go well beyond the standard, however, featuring the cheap-but-decent Sagres, and the pricier-but-more-decent Heavy Seas from Clipper City, in a variety of styles. The beer-lover will not go thirsty. The first impression of the establishment is “Tacky,” and the first reaction tends to be “Are they kidding?” But if you get beyond the initial trepidation, you’ll find first a good family-friendly restaurant (what kid doesn’t love non-Somali pirates?) with a unique menu and plenty of character. When you venture back to the bar, however, you’ll find much more. Eclectic music carries on in the background, not loud enough to drown out conversation. So it is easy to talk and expound with a collection of regulars and random guests the equal of any well-written sit-com. This may be why there is no need for a television, and the lack of TV may help make Piratz Tavern’s inhabitants such good company. When the weather is decent or even tolerable, the back patio opens up and further increases the bar’s appeal – not only because of the added space and thematic elements, but because the outdoor bar has what they lack inside: a keg. Okay, it’s only Landshark. But it’s not a major label, it’s quite drinkable, and, of course, it’s theme-appropriate. So wander in and give it a chance. The atmosphere may be contrived, but it’s a good contrivance. In a town short on bars, there is nonetheless variety. 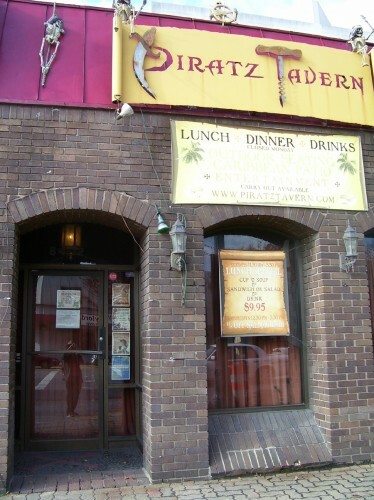 Case in point, Piratz Tavern. Pros: Atmosphere; staff; interesting patrons.